November 2014 Officer-In-Charge of a Navigational Watch Board Exam Results (list of passers, topnotchers, performance of schools) - Balita Boss! The Professional Regulation Commission or the PRC released the Marine Deck Officers November 2014 Officer-In-Charge of a Navigational Watch Licensure Examination results. The official results were released on Tuesday, November 18, 2014. A total of 1,329 out of 2,529 examinees passed the November 2014 Officer-In-Charge of a Navigational Watch Board Exam, according to PRC (via PRC Website). View or download the performance of schools in the November 2014 Officer-In-Charge of a Navigational Watch Licensure Examination at prc.gov.ph. 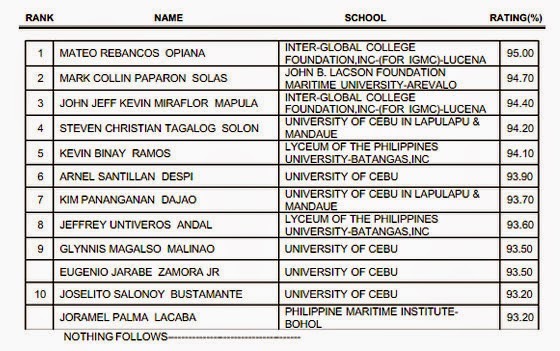 INTER-GLOBAL COLLEGE FOUNDATION,INC-(FOR IGMC)-LUCENA graduate MATEO REBANCOS OPIANA topped the November 2014 Officer-In-Charge of a Navigational Watch Board Exam with a passing rate of 86.20 percent. The Board of Marine Deck Officers who administered the November 2014 Officer-In-Charge of a Navigational Board Exam were Capt. Jaime D. Aquino as Chairman, with members namely Capt. Ireneo U. Delos Santos, Capt. Romeo C. Abuyuan and Capt. Marsolito A. Cruz. In January 2014 Licensure Exam, a total of 726 out of 1,384 successfully passed the Officer-In-Charge of a Navigational Board Exam.